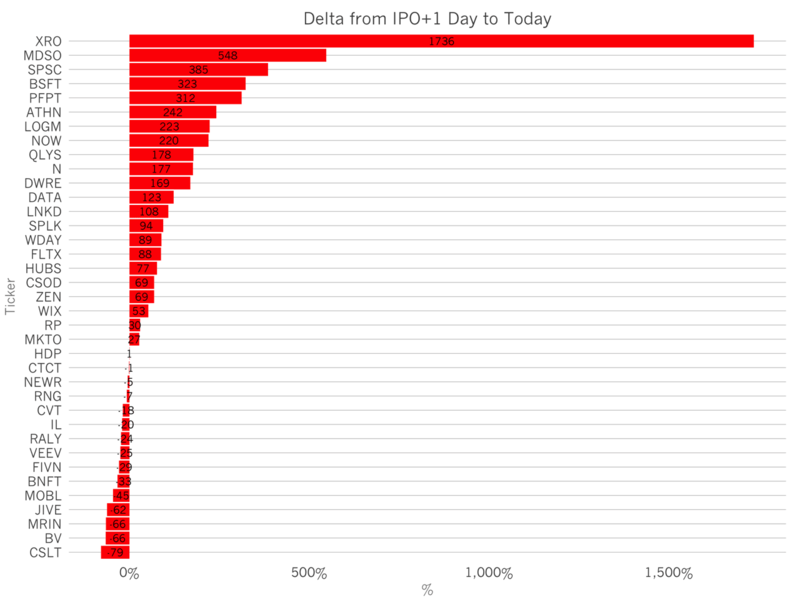 Of the 43 SaaS companies to have gone public in the time period between 2006 and 2014, 60% are trading above their IPO pop price – the price at the end of their first day of trading. The median company has appreciated 69% since its IPO. The chart above shows the trends for each of the companies in this data set. Xero tops the list that more than 17x appreciation. This is an anomaly; the company went public right as it was founded and has grown to be worth several billion dollars. It’s an amazing story. On the bottom end, Castlight has dropped by 80 percentage points in value since its IPO, to a market cap of about $850 million, and trades below the typical SaaS company at about 7x forward revenues. If you’re curious about the trends from IPO offer, you can find the chart here. In contrast to the balanced historical stock performance, when all of these companies went out for the IPO, there was broad excitement about them. The chart above shows the IPO pop, the change in share price from offering to first day trading close. Almost every stock, all except three, saw some appreciation. The average company’s market capitalization grew by 32%. 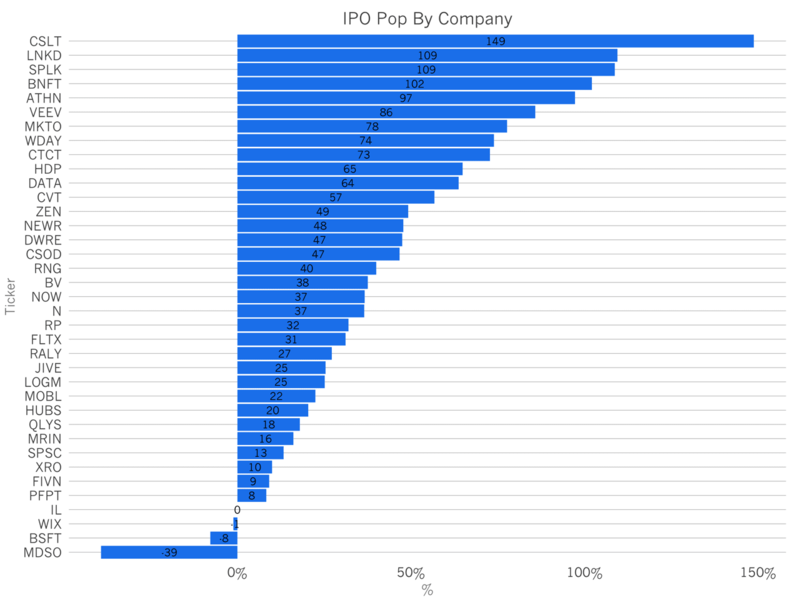 The data indicates, that despite relatively broad excitement for SaaS companies at IPO, eventually, the market discerns the differences in the revenue models, go to markets, and attractiveness of different businesses. 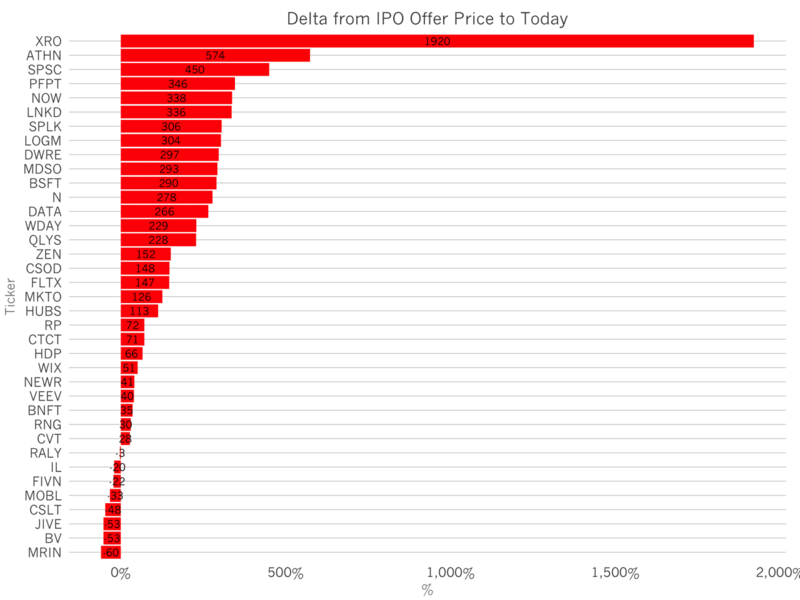 Looking at the IPO cohorts, we can see that the vast majority of companies have appreciated from their offer price. 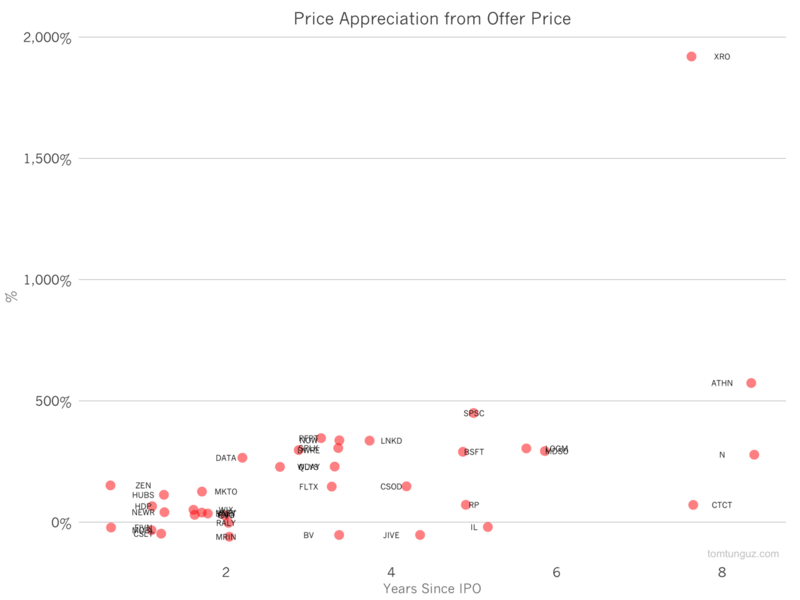 Here is a zoomed in version Even recent IPOs, some of which have faced skepticism, trade above offer. The data also shows that over time, companies appreciate more as their revenues grow. This is a very natural trend. But these companies have also had to fight multiple compression in the market. In 2014, revenue multiples fell by 30%, meaning any share price appreciation had to overcome this decline. Overall, the data tells a heartening story. There is quite a bit of excitement for new software companies in the public markets. But that enthusiasm isn’t blind. Public market investors are able to distinguish exceptional businesses from not so exceptional businesses. This judgment is healthy. It indicates the market that isn’t blindly investing in B2B technology companies. Rather, public market investors are pricing each based on the characteristics of the business’s prospects.